The recently released Padmavati trailer has not only captivated eyes of the audience but also the who’s who of Bollywood. One of them being Hrithik Roshan who was swooned by the epic trailer. 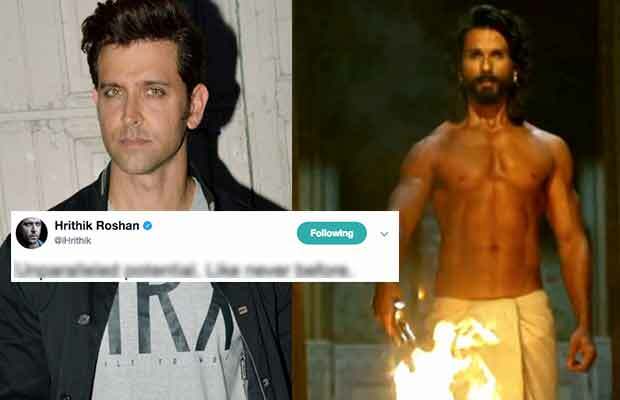 Hrithik Roshan took to Twitter expressing his take over Padmavati trailer which stars Deepika Padukone, Shahid Kapoor and Ranveer Singh. The actor shared, “Unparalleled potential. Like never before’. While the trailer received humongous response and appreciation from b-town, Hrithik’s comment was very special for Shahid. Shahid Kapoor who is one of the lead actors of the film replied to Hrithik in a heartwarming manner. Shahid took to twitter saying, “Thank you, my brother. Coming from you it feels special”. Previous articleBigg Boss 11: Zubair Khan REVEALS How Much He Was Paid Per Week For The Show! Next articleBigg Boss 11: A New Luxury Budget Task Commences Fraught With Fights- Watch Video!